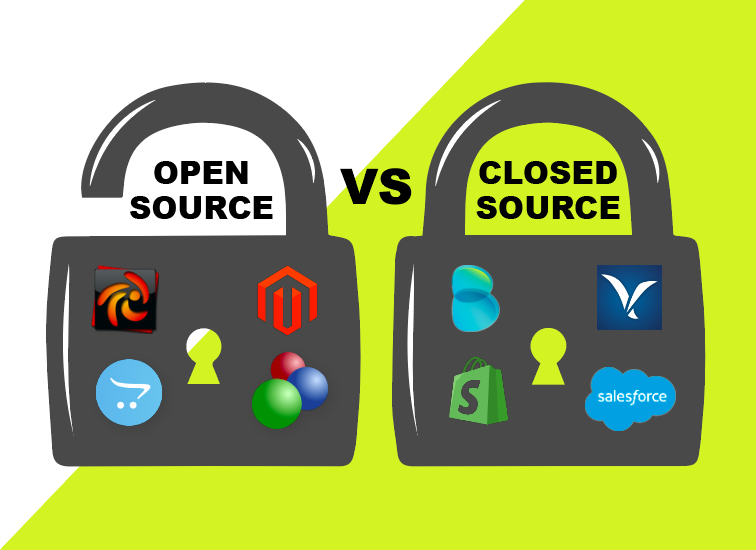 Home » LR News » Tips » Open Source vs Closed Source Platforms: Which is Better For Your Online E-Commerce Store? Being a small business owner comes with a lot of decisions, and setting up an online eCommerce site welcomes even more choices (and new terminology). What’s the difference between an open source and closed source solution? Which is the right solution for you? As a business owner, you have a lot on your plate – let’s simplify the differences between open source and closed source platform solutions to make your online business transition easier for you. In a nutshell, open source and closed source refer to the code that helps to build your web site. Open source builders make it easy for you to go into the code and change it. Closed source builders lock away the source code so it can’t be easily altered. Open source solutions are better for businesses that want a flexible and scalable site. An open source code gives you full control over every part of your website’s design, from the HTML to the CSS. And, when you (and your monthly sales) expand, you can scale your website without being charged for an increased sales volume. Closed source solutions are better for beginners or small businesses that don’t know how to code and don’t have time for it. The platforms usually come with intuitive drag-and-drop website builders and code-free plugins. They’re just easier to navigate and faster to set up (they’re also typically more secure, since their source code is protected). A few examples of these closed source platforms are BigCommerce, WordPress, and WooCommerce. Depending on your needs and the time you have to dedicate to your site, either solution could be more affordable for you. As far as the upfront costs go, open source platforms appear more affordable. They often offer free themes and plugins that can be customized with coding. Of course there’s still the hosting and custom domain name costs but ultimately, it is possible to use an open source platform for almost nothing. The one caveat with open source platforms is that their free plugin options may not be sufficient for your needs: you could end up paying for more powerful payment processors and other extras that add up quickly. This type of solution is better for expert coders or those with killer web design support. Closed source platforms often include charges for the extras mentioned above (plugins and payment processing) in their single monthly or annual fees, making their upfront costs look more expensive. They generally come with other costs as well, like transaction fees on sales. And, depending on the e-Commerce plan you’ve selected, you may also be capped at a certain number of transactions per month with higher monthly fees if your business expands (a limitation that open source software doesn’t have). If you or someone on your team knows how to code and design, it’s more cost effective for you to set up a website using an open source platform. Open source platforms require more work. While there are code-free web building options and plugins for social media integration and payment processing, open source solutions can take a little time to figure out and can be a struggle for novices. The plugins do, however, come with clear instructions, so open source can be manageable. Effortlessness is where closed source platforms shine. They can be set up and ready to go in only a couple of hours, complete with branding, payment processing, and marketing and conversion tools. Some apps can even provide a simple social media integration. Effective and attractive, the e-Commerce sites from a closed source solution can be intuitive (even when built by a novice). Open source platforms offer experienced coders room for innovation and flexibility. They also allow your creativity and imagination to take charge in designing your online e-Commerce site. Closed source solutions may seem to limit innovation but those new to website building will find many opportunities to be creative. Most closed source platforms also offer a CSS editor that makes it easy for experts to incorporate code, and drag-and-drop builders for design new-comers. Open source platforms often have opportunities for bugs and viruses to wiggle in. Piecing together extensions and plugins can sometimes leave gaps in your security setup. You may need to be a little more diligent with your security, but many open source users do insist that using a secure hosting option and keeping plugins up-to-date provides a secure site (similar to closed source). Typically, closed source platforms come with extra protection (some even offer custom SSL certificates). They also only use software which has been extensively tested for bugs, viruses, and Trojans so you’re paying for extra convenience and security. Which is better: Open Source or Closed Source eCommerce Web Builders? There’s really no cut and dry answer to whether an open source platform or closed source is better for your online business. It ultimately depends on your specific needs: how you’d like to build and maintain your site, if you’d like access to code-level changes, and whether you project a lot of changes in the future. Whatever your online business needs are, Linked Retail is here to help: we offer packages and services for setting up and maintaining both solutions, making everything online easier for you.